A: Most of our dogs come from high kill shelters in Northern Mississippi. Sadly, great dogs of all breeds and ages are euthanized daily due to overpopulation, lack of subsidized spay/neuter clinics, and inadequate funding. Many dogs also come from surrounding communities that do not have shelters. Without rescue, many of these dogs would end up on the streets. With the help of volunteers and fosters, it is our mission to save as many of these dogs as possible. Q: Where do your dogs go to? A: Our dogs are adopted out either locally or to individuals who live outside of Mississippi. Some of our dogs are transported up north to be adopted via our partnership with the local humane society, Oktibbeha County Humane Society . The program helps us move unwanted dogs to places where they're in demand. Location is everything: Some cities have too many homeless dogs and puppies; others have waiting adopters. This program transports selected dogs and puppies from shelters and rescues in areas where there are more dogs and puppies than can be placed through adoption. They are transported to places where they get adopted, often within days. Q: If I am the first person to apply for a dog, will I get him? A: Maybe. We are not a "first-come, first serve" rescue. We try our best to find the best match for our dogs and our adopters. Being first doesn't hurt, but it's not a guarantee. We are committed to being as open and honest about the selection process as we can. Our goal is to choose the best possible home for each of our animals. A: Our adoption fees, much like the fees of other rescues and shelters, vary based on the dog. Because we are funded solely on adoption fees and donations, we are able to set the fees for dogs who are higher in demand at a higher price, in order to help support those dogs who may be harder to place. To inquire about the adoption fee for a particular dog, please send us an email. Grassroots Animal Rescue is a non-profit public charity that is not funded or subsidized by any state or federal agency. We do not get any tax dollars. We rely solely on adoption fees, donations, and fundraising efforts to keep our rescue operational. 100% of each adoption fee goes towards our rescue expenses which include: transportation from high-kill shelters, food, veterinary care, medication, training, and other basic essentials to keep our dogs healthy, well-balanced, and ready for their forever homes. Q: Can you guarantee a dog's breed? A: Rarely. Unfortunately, the inherent nature of dog rescue means that we usually cannot guarantee a dog's breed. Many dogs end up in shelters because they are strays. Many more are turned in by owners who don't know or don't share their pet's history. Even when we know a puppy's parent, we only know half of the mix. The best we can do is make an educated guess based on the dog's appearance, size, and temperament. We do occasionally get dogs that are purebred, and some of these dogs even have registration papers. In these cases, we feel confident in guaranteeing a dog's breed. Q: Can you guarantee what size a puppy will be as an adult? A: Unfortunately, no. Because we usually don't know either of the puppy's parents, we have no idea what lies in his or her gene pool! We make an educated guess based on the puppy's size, age, and estimated breed mix. A: We are a foster based organization in Starkville, Mississippi. This means we do not have a kennel or main facility that you can visit. With fundraising and donations, we hope to have a facility to house more dogs in the near future. But for now, our dogs are spoiled by our foster families. A: Unfortunately, no. We are a 100% volunteer-run organization with no paid or full-time staff. Our volunteers run Grassroots Animal Rescue in addition of their full time jobs outside of the rescue. Because of this, we do require that adopters either drive to Starkville to pick up a dog or use Delta Airlines (see below) to transport the dog. At this time, there are no nearby land transportation services available to us. A: Maybe. We can only take a dog in to our rescue if we have a foster home available to house the dog and if we have funding available to care for the dog. Because we are a private rescue, not an open admission shelter, we do have to turn animals away sometimes. If we are unable to take in a dog, we will do our best to direct you to other helpful resources. Q: Can I surrender a cat or kitten to Grassroots Animal Rescue? A: No. At this time, we are only able to rescue dogs and puppies. If you have a feline that needs rescue, we will do our best to put you in contact with another organization that may be able to help. Q: Do you adopt to individuals who do not live in Mississippi? A: Yes, we do allow out of state adoptions; however the costs associated with adopting a dog from out of state are the responsibility of the adopter and are in addition to the dog's adoption fee. If you are not local, there are two options for you to get a dog: 1) Drive to Starkville, MS to meet and adopt the dog or 2) Use Delta Airlines to fly the dog to you. We use Delta Airlines to transport dogs frequently with good results. Dogs from Grassroots have traveled all over the United States via Delta, from Alaska to New Hampshire. We have also sent three dogs to forever homes in Canada! The cost associated with flying a dog varies based on the size of the dog and the final destination, but the cost is typically between $300-$400, including the airfare, airline-approved travel kennel, and inter-state health certificate. 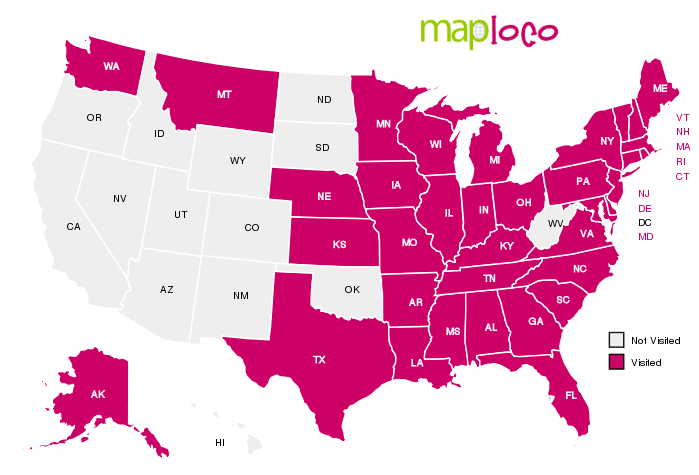 To see what states our dogs have been adopted to, please see the map below!